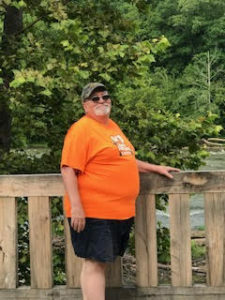 Dennis L Dieball, age 66, of Adams Wisconsin, formerly of Milwaukee Wisconsin, passed away on March 13, 2019, at WM S. Middleton Memorial VA Hospital in Madison Wisconsin. A local celebration will be held on April 27th, 2019 from 4 to 7 p.m. at Grand Marsh Area Community Center. A celebration of life will be held on June 8th, 2019, starting at 1:00 pm at Monches Rec Club in Monches Wisconsin. Military Honors will be at 3:00 p.m.
Dennis was born on April 16, 1952, in Hartford Wisconsin to Lloyd and Shirley (Voss) Dieball. Dennis enjoyed hunting and fishing with family and friends. Dennis married Debbie Woods on June 14th, 1980. Dennis served in the Army Reserves until he was honorably discharged in June 1976. He then started working for Milwaukee Electric Tool for 20+ years. While raising 3 children and working at Milwaukee Electric Tool he also took a job as a bus driver for Laidlaw Bus Company in Brookfield WI until he moved to Adams in 2009. Dennis enjoyed playing cards, bowling, darts, and spending time with family and friends. He also enjoyed helping with the youth football and wrestling programs. Dennis was preceded in death by his wife, Deborah Dieball; parents, Lloyd &Shirley Dieball, and sister-in-law, Annie Dieball. So sorry for your loss, he was an amazing guy. Will miss sitting by him at football games. Thoughts and prayers are with you all. So sorry for your loss. Sending hugs. I’m so sorry for your loss. Dennis will be greatly missed. Big hugs to you guys if you need anything let me know. I am sorry for your loss! He will be greatly missed by all who knew him. So sorry to hear. Prayers to you and your family. I’m so sorry for your loss, your family is in our thoughts & prayers.